Indy L-Series Generation 2 LED downlights provide efficacies up to 70 lumens per watt (lm/W) with parabolic reflectors, and up to 85lm/W hyperbolic reflectors. The fixtures can be applied in ceiling heights from eight to 50 feet, and are available in eight light engine lumen packages, up to 46-watt 4000 lumens. 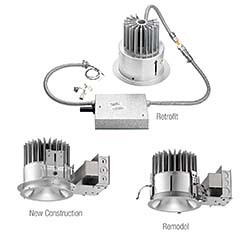 Retrofits 6- or 8-inch downlights.